Tough Cookie uses hiking poles for the first time as she navigates open ledges. Note her school bag. I’m startled at how many mushrooms and other fungi exist on a trail. Janelle and Aaron find all of it, every last stem and sprout. And look at that weirdly shaped tree! And what creature lives in this hole? The boy is able to identify more flora than I am. I can’t answer their questions about simple tree identification. I’m in trouble here. I’ve hiked to Everest Base Camp, and walked across England. I’ve climbed all 48 of New Hampshire’s 4,000-footers in 20 days. But this is different. I’m getting beaten up badly when it comes to micro-hiking. I make a mental note to begin looking this stuff up when we get back. I consider simply calling off the hike and letting the kids run into the woods ten feet from the trailhead, and sitting down on a rock and waiting until they are done. It would be the most deeply explored 100 square feet of forest in all the White Mountains. After three hours, they would be able to write their college thesis on that patch of land. Location: Near Waterville Valley. I-93 to Exit 28 to Route 49 to Upper Mad River Road west (for 0.7 miles) to Orris Road north (for 0.6 miles). 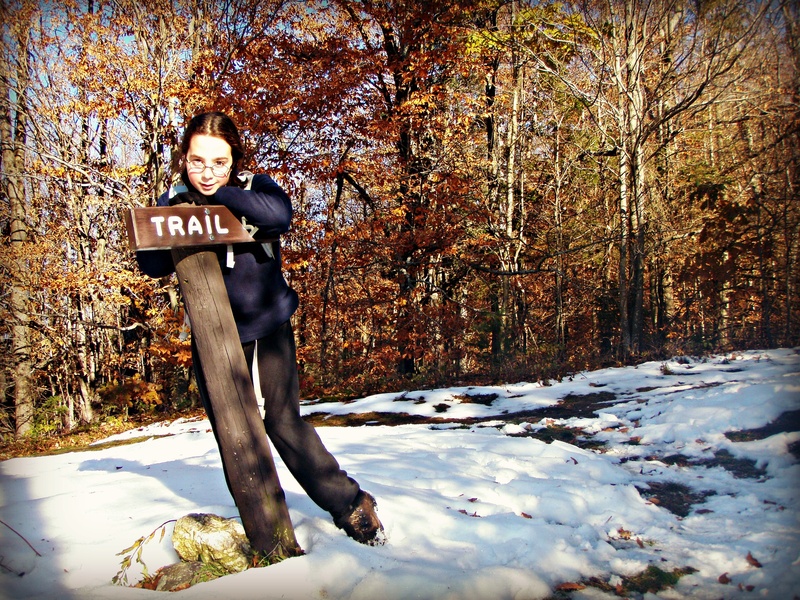 Our trailhead: The Welch Dickey Loop Trail, up and back. Distance: 4.4 miles round trip. That’s one tired Tough Cookie at trail’s end after reaching her first 52’er. On a cold but cloudless November day, Janelle and I take our first steps toward Mt. Kearsarge and toward a journey that will ultimately change both our lives, though we don’t know this yet. I walk up the road with this child, pointing out late-season chipmunks, trying to gauge how easily, or not, she gets cold. I have no clue how this is done. I have no clue who Janelle is. She is eager, and strong. That much I know from the few small hikes we’ve taken prior to this big one. And she does not complain easily. I’ve never hiked a serious mountain with a child before. Alone. So, I’ve loaded my backpack with so much emergency gear, it feels like we could be out in the woods for weeks. There’s a road walk to the trailhead first, only about a mile, but she begins asking me when we’ll get there about half way up. I wonder if this is going to work. 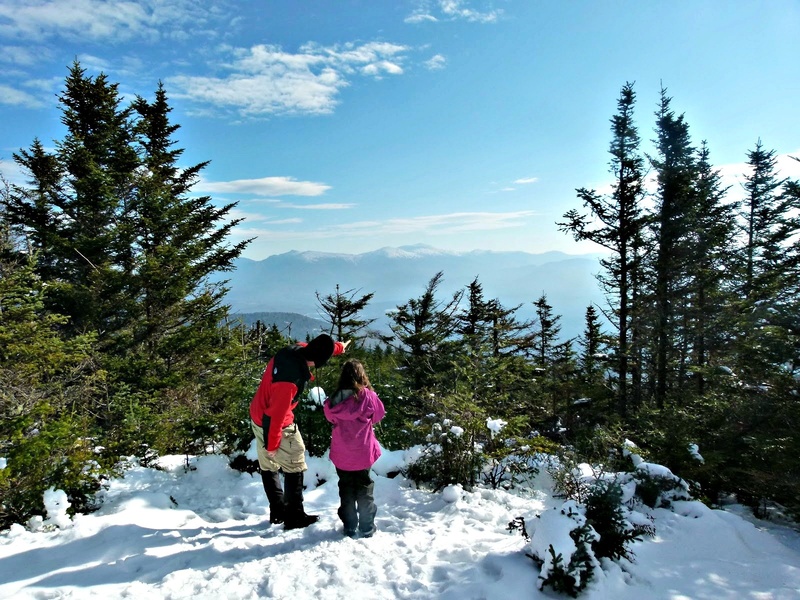 I’ve heard horror stories from other parent hikers about the difficulties of getting their kids on the trails, away from the electronics, willingly into the wilderness. I wonder which way this is going to go. Location: Wilmot. I-93 to I-89 to exit 10 to Kearsarge Valley Road to Kearsarge Mountain Road. Distance: 4.2 miles round trip, including the road walk. Janelle with the amazing Herr ladies near the summit of Mt. Waumbek. Upon reaching her first 4,000 footer, after this past year of triumphs, open spaces and spectacular landscapes, Janelle stands for a moment at the viewless summit looking at the snowy cairn marking the top. Her friends Alex and Sage are already settling in, digging into their packs for snacks. They’ve reached many such summits before and are familiar with the satisfaction of a below tree-line goal. She wants to ask me where the heck is the view? Later, she will timidly ask just how many 4,000 footers are below treeline. Instead, for now, she smiles and says, “thanks!” The joy of the 52 With a View list is that every reward, on every hike, is external. There is some view, somewhere, waiting on every hike. The 4,000 footer list? Well, let’s just say you have to find inner peace on some of those hikes. That’s another lesson for another time. And in the end, I don’t even know if Janelle is interested in pursuing the 4,000 footers. I suspect she’ll hike with me wherever I take her, but just as our quest for the 52 was a mutual project, I want our next “list’ to be mutual as well. So, for now, the girls celebrate Janelle’s accomplishment with candy bars and cookies. And we all head down the trail a ways and do find a nice view near the summit. Gray Jays buzz above our heads, little blurs. For some reason, they do not land on our hands today. That’s a joy that will have to wait for Janelle. The others leave us at this lookout, and I have a few moments to watch the girl as she tries to attract the birds, standing there atop her highest mountain, all 52 (plus 1) peaks behind us. I try to be in the now, but I fail. The future is calling. “Ready to go?” I ask. A moment of reflection near the summit of Mt. 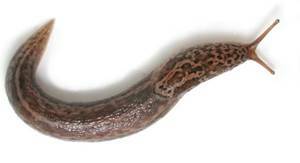 Waumbek. 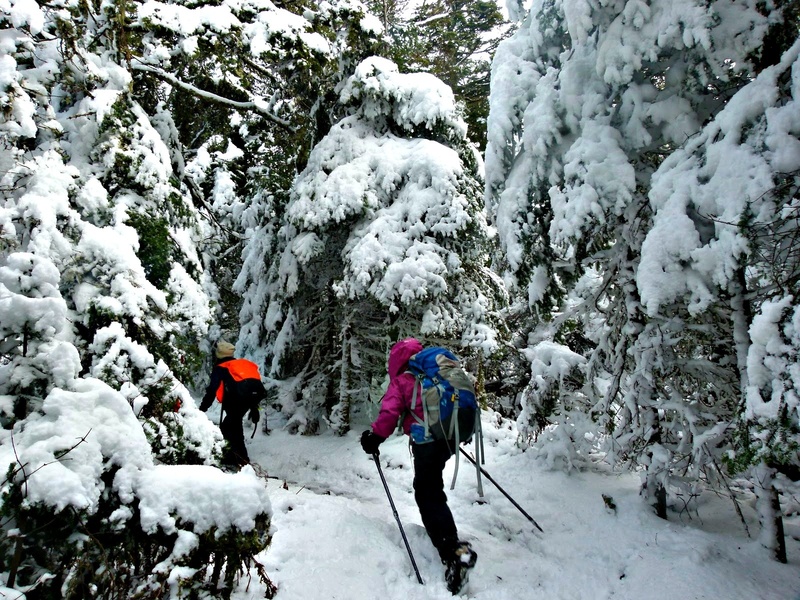 For now, winter has arrived, Janelle’s first for big mountain hiking and we have several goals for this winter season. 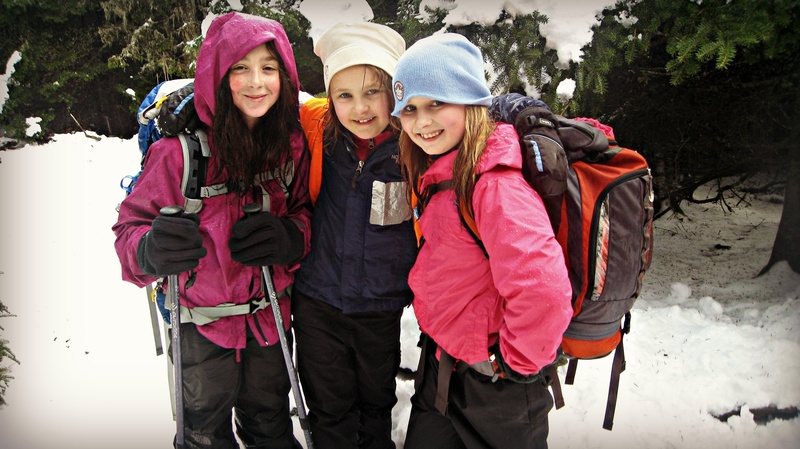 Learn how to snowshoe: In order to do anything else on the winter list, this has to be a priority. There’s plenty of local parks where we can practice, that is if it ever snows in Manchester again. Lonesome Lake Hut: Janelle has never visited a full-on AMC Hut AND she wants to hike across a frozen lake. So this hike is a no-brainer. Flume Gorge: We both love frozen waterfalls, and she wants to see ice climbers. So, a hike down to the lovely Flume Gorge is on tap. 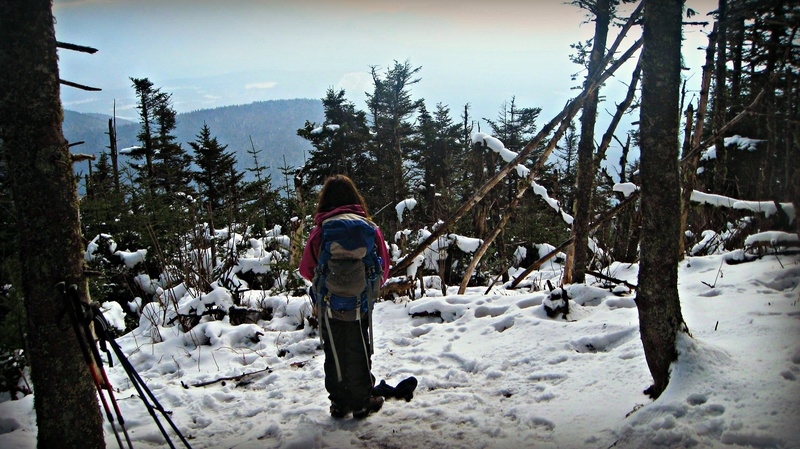 One winter 4,000 footer: She’s done one and there are several 4,000 footers out there where the views and hike actually improves in the winter. Tecumseh. Tom. Pierce. Perhaps even Moosilauke. They are all within her ability. Urban exploration: We both love exploring the unusual and off-the-beaten-path trails around Southern New Hampshire. Adventure is where you find it, and we plan on looking hard. The book: It’s all hands on deck now as we prepare for the release of the book and (hopefully) all the events that will come out of that. Stay tuned here and on our Facebook page for updates and info on presentations as we’d love to meet you all! Our supporters, friends and fans: Thank you! You all have energized us with your support and we can’t wait to see what’s around the next bend. Find peace, and keep hiking your own hike! Ever onward! Photo courtesy Tish Herr. The sun sets on our journey, from atop Starr-King. Photo courtesy Trish Herr. We stand alone, just below the summit of Starr-King with only 100 feet left to conclude our quest. Wet snow drips like rain from the branches above us. Steam rises from our clothes. “What are they doing?” Janelle asks. Alex and Sage have joined us on this final hike. The two left for the summit a few moments ago, along with their mom, Trish, and our friend Steve. There’s too much to say to her. After more than a year, after all this quest has cost us, after all we’ve grown and changed, to be steps away is nearly too much to bear. She is bursting with energy; jittery, unable to stand still. I only have a few seconds, but I simply cannot form the right words. So, I get down on my knees in the snow, and turn her toward me. She’s smiling, icy snow dripping off her eyelashes, cheeks beet red. I pull my hiking partner to me and hug her. With gloves and over full packs, the hug feels clumsy. Snow sitting atop our shoulders and hats runs down our backs, but I hold on for a little too long and thankfully she lets me. Tough Cookie turns back to the trail, and forges ahead, confident, strong and sure; my powerful spider monkey moves away from me and up into the sun. Location: Jefferson. I-93 north to Exit 35 to Route 3 north to Route 115north to Route 115A to Route 2 through Jefferson, trailhead at end of Starr King Road on left. At the summit of Tough Cookie’s first 4,000 footer, Mt. Waumbek. Well, it’s been quite a ride, and the good news is that the adventure is just beginning! Join us on Thursday for an update. Where are we? Where are we heading? And what’s next for Buffalo and Tough Cookie. We’ll also have a report on Janelle attaining her first 4,000 footer, Mt. Waumbek. Until then, on behalf of Janelle and myself, thank you all for being part of this quest. We can’t wait to turn the page and get going on the next chapter! We hope you’ll all join us! 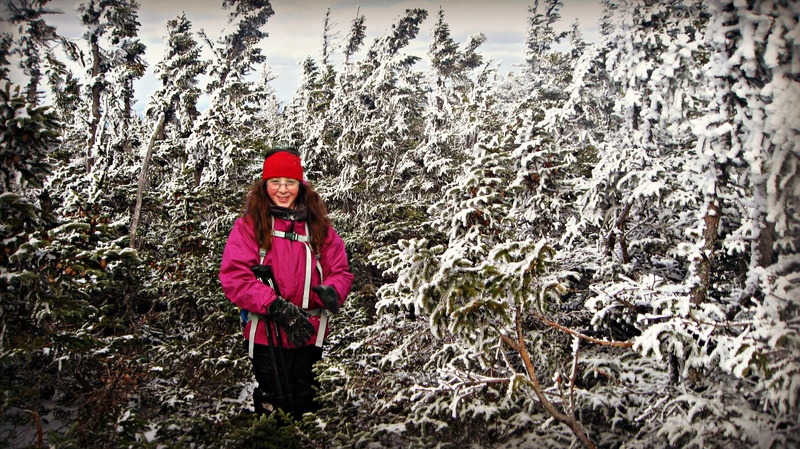 A winter wonderland high atop Shelburne Moriah. The mountain gods are merciful today, a gift perhaps for all our hard work the weeks before. If there is a single moment to take away from this whole journey, it is this one. We are alone, sailing along the Shelburne Moriah ridge, two travellers moving through the spectacular landscape; our breath strong, legs sure. Our stabilicers clack comfortably on the frozen granite. The wind is slight, the sky deep blue. The girl moves ahead of me, as always, a small pink and red form. She rarely needs help with directions now. 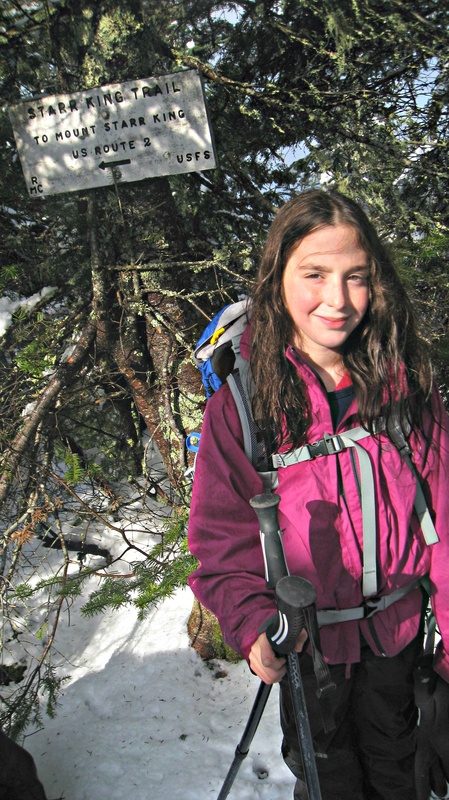 The early first hikes where she’d agonize over blazes or get frustrated at trail markers are long behind her. She sees like a hiker now. I watch her shift her poles this way or that, pausing nearly imperceptibly occasionally to seek out the next yellow slash or twist in the trail. Above treeline, the blazes or cairns are what guide us as we wind our way toward the summit of Shelburne. The day has already been long and we both know we won’t make it back to our car before dark, but it doesn’t matter today. We climb up a small hump and come to a vast clearing and Janelle does stop there. “Is that the summit?” she asks, pointing ahead to an outcropping maybe a quarter-mile away. She shrugs. It makes no difference to her, or me, here, in this place above the clouds. She spins fully around, taking in the deep views and the soft white snow coating the pines. To our immediate west, Moriah and the Carters roll pleasantly in the shadow of the northern Presidentials. “That’s Mount Washington,” I say and point with my walking stick to the Northeast’s highest point. The air is so clear, we can see the tips of the observatory and summit buildings glimmering like diamonds. Janelle studies Mt. Washington for a while, tilting her head as though she’s about to say something. But she keeps it inside. I wonder how long I have before we’ll be headed there. Next summer maybe? The miles pile up, and we are fully burdened with winter gear and food. But it is also a day without worry, a day when we have come together fully, in a place that has cauterised our love of hiking and of being with each other. We hope you enjoy the slideshow we put together to highlight this particular, wonderful hike! Join us next week for the final two vignettes of our amazing journey! Location: Gorham. I-93 north to Exit 35 to Route 3 north to Route 115 to Route 2, through Gorham to trailhead on right. Our trailhead: Rattle River Trail to Kenduskeag Trail to summit, out and back.